One of the world's largest Holocaust archives, recording the fate of 17 million people, could be made available in Britain for the first time - if the money is found to fund it. 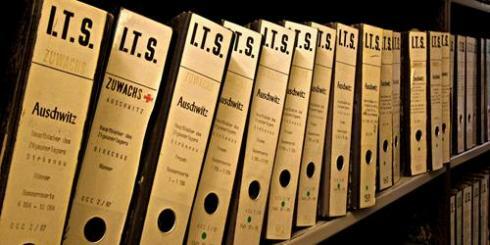 The International Tracing Service (ITS) archive contains more than 50 million pieces of information, using records from concentration camps, ghettos and displaced persons' camps. It was initially created by the British Red Cross in 1943 to help those disrupted by the war to trace their families. A digitised version of the records will soon be available at the Wiener Library at its new home in Russell Square, central London. Organisers need around £60,000 to cover the cost of bringing the documents to Britain, and a further £70,000 a year to make them available for free viewing. At a Foreign Office launch on Wednesday, Foreign Secretary William Hague said: "It is more important than ever that we recall those terrible atrocities. Much has been done on post-Holocaust issues, but it is my belief that we can be more active and do more to represent the interests of Holocaust survivors and their families. It's only right that the archives should be held here in Britain. "The archives offer a unique insight and understanding into the genesis of genocide. Atrocities in countries such as Bosnia and Rwanda in our own time show there are still lessons to learn." The launch was attended by representatives of organisations which work with Holocaust survivors, including the Holocaust Educational Trust, Jewish Genealogical Association, Association of Jewish Refugees, the Federation of Poles and the Gypsy Council. Anne Webber, chair of the group which has overseen the process of bringing the archives to this country, said: "Since the archive opened, brothers have found sisters, sons have found mothers, each of whom had never known the other had survived." Among the available documents are those of Anne Frank, Elie Wiesel and around 1,000 of the names featured on "Schindler's List". The documents have more recently been cited as evidence for survivors to claim compensation. Last year requests were made for information about more than 12,735 individuals. One of the biggest challenges is the dozens, sometimes hundreds, of spellings and variations of names such as Cohen, Schwarz or Abramovich. Rebecca Black, 24, granddaughter of survivor Eugene Black, said: "By bringing the archives to this country it will allow more families to understand the fate of their loved ones. "The bureaucracy and noting of dates and times of murders is sick, but without this evidence, we would not have the chance to pass the lessons on to future generations." Jeno Schwarcz was born in February 1928 in Munkacs, Czechoslovakia. On May 14, 1944, he was arrested, with his two sisters and parents, and deported to Auschwitz-Birkenau. When they arrived at the camp they were separated and Jeno never saw his family again. He survived and was liberated from Bergen-Belsen in April 1945, unaware of his family's fate. He eventually moved to Britain, settled in Leeds, and took the name Eugene Black. Mr Black told the audience at the launch of the archive how the records had helped him, more than 70 years after being separated from his family. "After continuous enquiries at Bad Arolsen I went to Germany in 2008 with my daughter to see the archives. "Immediately I was made to feel at ease and my documents were produced: my identity card, my records, a list detailing my transportation, even a photo of me. "I was shocked and surprised. They even had a certificate that would have allowed me to go to Palestine in 1945 after leaving Bergen-Belsen. I was not even aware the documents existed. "My sisters were killed when the SS denied them access to a shelter during an RAF raid on the refinery. "I broke down and cried. For 64 years I believed my sisters perished with my parents in the gas chambers. "The very next day we went to the cemetery in Gelsenkirchen to pay our respects. I have been back three times since. "I would never have known if it was not for the hard work put into creating these documents. I'm delighted that the archives will be available for people here in Britain who were not aware they existed."